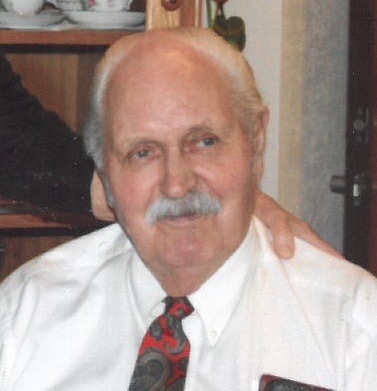 Roy Starkey, 91, of Brainerd, MN died Thursday, March 28, 2019 at Essentia Health-St. Joseph’s Hospital in Brainerd, MN. Funeral services for Roy will be 10AM, Thursday, April 4, 2019 at Brenny Family Funeral Chapel in Baxter, MN with Pastor Lowell Clarke officiating. Visitation will be one hour prior to the service. Interment will be at Evergreen Cemetery in Brainerd, MN. Roy was born October 7, 1927 in Ludden, North Dakota to Eric and Mary (Haavisto) Starkka. He was raised and educated in Oakes and settled in Pine River, MN. Roy was married to Deloris Louise Holbrook on April 29, 1950 in Maple Grove, MN, settling in Brainerd. He worked as a stockman with the railroad for 47 years and ran the Standard Oil on Washington Street in NE Brainerd. Roy enjoyed traveling, fishing, baseball and working on cars. Deloris died December 22, 1986. Roy married Geraldine Whirley on December 28, 1991, she died September 9, 2018. Roy is survived by his son, Darwin (LorRae) Starkey of Boquete, Panama; three grandchildren; 11 great-grandchildren; seven great-great-grandchildren; siblings, Raymen of Sun City West, AZ, Carl (Vicki) of Brainerd, MN, Lorraine of Sun City West, AZ. He was preceded in death by his parents; both wives; siblings, Ernie, Ralph, Helen, Violet, Gloria and Millie.